I'm 16 weeks pregnant and even in 32 degree (91 F) and I'm making cinnamon buns right now. I need them . That's what she said! Sorry, couldn't resit. These look fabulous. I tried PW's recipe, and was left wanting. Will definitely be trying these! Oh man, now you've got me craving one too Josie! There's not much better than a warm cinnamon roll for an indulgent breakfast. For some reason I've never made cinnamon rolls! I agree Peter Reinhardt is THE person to trust when it comes to yeast recipes... I'm going to do this! These look delicious! I pretty much love anything loaded with cinnamon, so I am definitely going to have to try these. The portion that you froze -- did you freeze them before baking or after? I'm always so confused when it comes to freezing! I just stumbled across your blog, and I absolutely love it! 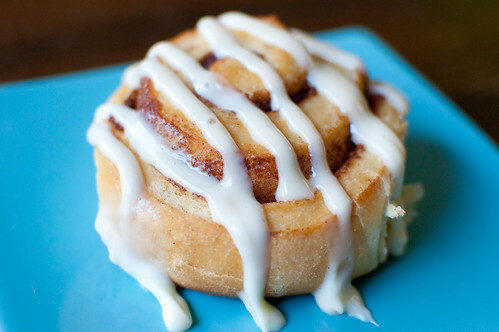 The cinammon rolls look picture-perfect! These look lovely! I haven't made cinnamon rolls in such a long time! I love the overnight idea. These sound fabulous! I've only made cinnamon rolls from scratch once but it wasn't an overnight recipe. I wish it had been though, overnight sounds so much easier. Thanks Josie now I seem to want one of these VERY badly! I've wanted to make cinnamon rolls for a while now. Thanks for the reminder, these look scrumptious! These remind me of Christmas Morning,I just had to try your recipe, so yummy, I finely chopped up some toasted pacans butter, doubled the sugar, and a bit more cinnamon. I Love your bread part, it is so fantasticly silky. And yes I did try a batch as you made them, they were fantastic. I am just a nutty person. Thank You Sooo much. These are gorgeous! 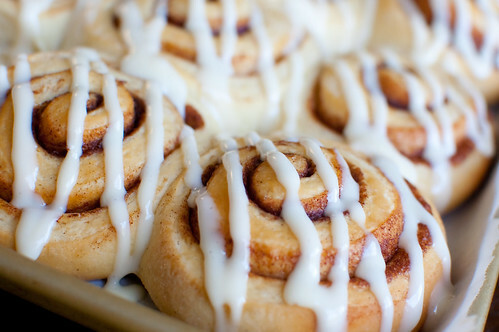 They look just like the Cinnabon Cinnamon rolls! I was JUST at the market and noticed cinnamon rolls on sale. How did you know that I thought to myself, "I really should learn how to make my own." Thank you for the encouragement & motivation! "Keep it simple, stupid. Great advice, hurts my feelings every time." Love it. These look wonderful. I need to re-blog cinnamon rolls at some point because my originals were fug. just wanted to tell you that I recently found your blog through pinterest and I love all your recipes. Will definitely be back to try lots more! So weird. I'm reading the comments for these (looking for a new cinnamon roll recipe to make tomorrow, Christmas Eve night) while I have The Office "Initiation" episode playing in another window. It literally was playing the K.I.S.S. phrase as I read Annie's post. I know. Completely unnecessary comment. Thank you for the recipe, though! Merry Christmas! !